Japan’s Sharp will launch in May a smartphone that’s built into a humanoid robot. Or is it a humanoid robot with a built-in smartphone? The Robohon is said to be the world’s first mobile robotic phone—and judging from the price and slightly unwieldy form factor could also be the last. It’s 19.5 centimeters (7.7 inches) tall and weighs 390 grams (13.8 ounces), making it several times the size and weight of a conventional smartphone, and it will cost 198,000 yen, which is just over $1,800 and more than double the price of a high-end iPhone. But those shortcomings are more than made up in cuteness. 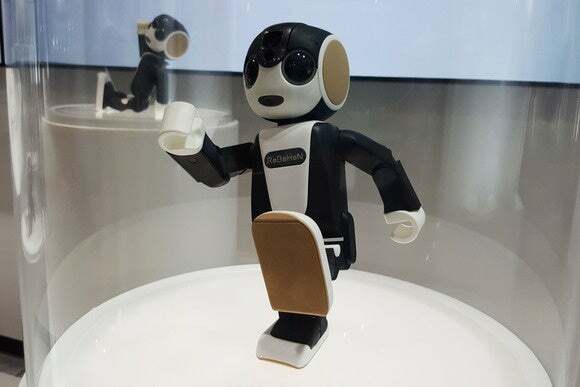 Sharp’s RoboHon on show at Ceatec in Japan on Oct. 6, 2015. 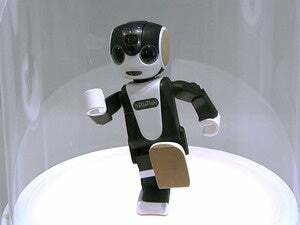 The robot can walk on its two legs and will even talk back to its owner, although the extent of its vocabulary and ability to communicate is limited. In one demonstration when it was previewed last October, the robot displayed a picture of a sunset prompting the owner to remark on how beautiful it was. “Yes, it’s beautiful,” replied the robot. The conversation functions works through a cloud service and that costs an extra 980 yen (US$9) per month. Users that don’t pay for that won’t get to chat with the robot. 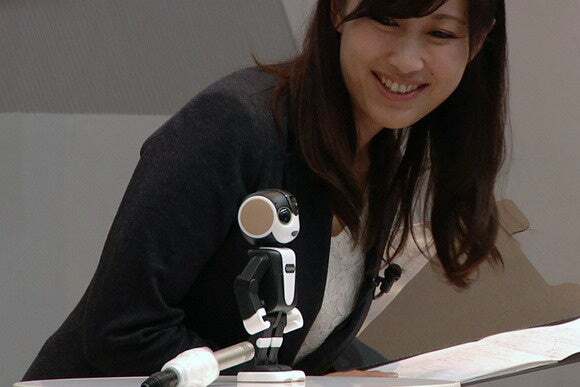 A person interacts with Sharp’s RoboHon during a news conference in Japan on Oct. 6, 2015. The vision for the Robohon is very much that of Tomotaka Takahashi, CEO of robot development company RoboGarage, which co-developed it. He designed the robot to have character and play a role as a companion for its owner. 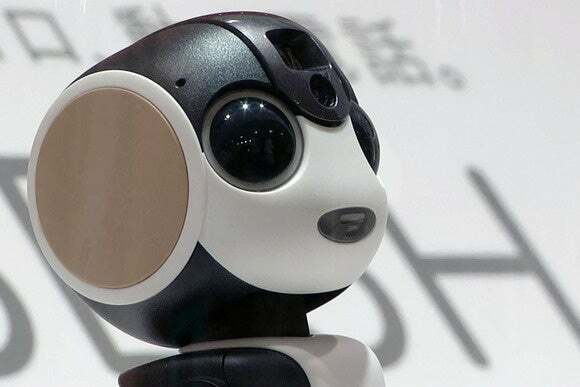 Tech-wise, the Robohon features a 2-inch display on its rear, an 8-megapixel camera and, in its head, a projector that can display HD (1,280 by 720 pixel) quality images. It runs Android 5.0. A phone call is simulated on Sharp’s RoboHon at Ceatec in Japan on Oct. 6, 2015. Sharp hopes to sell about 5,000 of the Robohon each month. It will be available from May 26 in Japan only through carrier NTT DoCoMo.